Dr. Donald Whitney: Why Join A Church? Now he really had me. His question struck me with an uncomfortable logic. I began to realize that many of my conclusions about church membership were actually nothing more than previously unchallenged assumptions. These assumptions were now melting into questions of my own. Can I give reasons from Scripture why anyone should join a church? Did the Christians in New Testament times formally join churches or did they more of an informal relationship? Did the churches in the days of the Apostle Paul have a membership list? How do I respond to the rising tide of opinion that says church membership is merely an unchallenged, but unbiblical tradition and an unnecessary formality? At the very least, the local church was the fellowship of the followers of Jesus Christ in a particular area. We know that they met together, worshiped together, prayed together etc., as the born-again family of God. But did people actually join this fellowship in some official way, or was it a mutually-assumed and less formal association? We know that churches in the days of the Apostle Paul made and maintained at least one type of list. “No widow may be put on the list of widows,” Paul instructs Timothy, “unless she is over sixty, has been faithful to her husband,” etc., (1 Timothy 5:9, NIV). As easily as the churches had lists of widows, they could have had lists of members. There would be no difference except for length for a church to keep a widows’ list and a membership list. There was a sexually immoral man in this church. Was Paul simply telling them not to let this man come to church with them because he was acting like an unbeliever instead of a Christian? No, he couldn’t have meant that, for we know from other places in this letter (cf. 14:24-25) that unbelievers were welcome to attend church meetings. Even when they obeyed Paul’s instructions to “put away from yourselves the evil person” and considered the man an unbeliever, they would have allowed (even welcomed) him to come and sit under the preaching of God’s Word like any other person in town. So in what sense would they have “put away” (“remove”-NASB, “expel”- NIV) this man? The best way of explaining how they would have “put away” this man is to understand that they removed him from the membership of the church and generally stopped associating with him outside the church meetings. Church discipline must be done by the “church” (Matthew 18:17) and occur “when you are gathered together” (1 Corinthians 5:4). Who is to gather together? How do you know who the “church” is? How do you determine who does and does not have the right to speak and vote on such matters? Does the person subject to discipline have the liberty to bring in his extended family or coworkers who have never been to the church, or even people off the street, and expect them to be given an equal say with those who have been faithful to the church for years? No? Why not? Do you exclude them from involvement because they’ve never been part of the church? Then what about the person who attended once five years ago? Or those who came at Easter and Christmas last year? Or those who regularly watch the church services on television or listen to them on the radio, and perhaps even send money, but never enter the building? Or those from distant cities who visit several times each year because of family members in the church? Obviously, Biblical church discipline must be limited to a specific group and that must mean the church members. In Acts 5:13 we read of the reaction of the non-Christians in Jerusalem after a couple within the church, Ananias and Sapphira, had died on the spot when it was revealed that they had lied to the church. It says, “Yet none of the rest dared join them, but the people esteemed them highly.” The unbelievers had great respect for the Christians, but after this incident none of them who claimed to be converted but were outward-only believers wanted to join the church. In the Greek language in which Paul wrote this letter, the word he used that’s translated here as “join” literally means “to glue or cement together, to unite, to join firmly.” It doesn’t refer to an informal, merely assumed sort of relationship, but one where you choose to “glue” or “join” yourself firmly to the others. Again, that kind of language only makes sense in the context of membership. That same “glue word” is used in the New Testament to describe being joined together in a sexual relationship (1 Corinthians 6:16) and being joined to the Lord in one spirit in salvation (1 Corinthians 6:17). And it’s the very same word Paul uses in 1 Corinthians 5:11 when he says “not to keep company with” any so-called brother who continues in immorality, but rather to “put away from yourselves the evil person.” Clearly this kind of language doesn’t refer to a casual, superficial, or informal relationship. So when it says in Acts 5:13 that no insincere believer “dared join them,” the “glue word” used there speaks of such a cohesive, bonding relationship that it must be referring to a recognized church membership. Imagine the leaders of the Corinthian Christians walking into the gathering of the church for worship one Sunday. Would they have known by looking, or would they have had some way of deciding, whether “the whole church” was there? Surely they would have known who was supposed to be present in a churchwide meeting and who was missing. But how else could they have known when “the whole church” was “together in one place” without knowing who was a member and who wasn’t? This implies a verifiable membership. “This is a faithful saying:,” said Paul to Timothy, “If a man desires the position of a bishop, he desires a good work” (1 Timothy 3:1). In other places the New Testament also refers to a bishop, or “overseer” as the NIV and NASB render it, as a pastor or elder (Acts 20:17, 28; Philippians 1:1; Titus 1:5-7). But what or whom does he oversee? How can he provide spiritual oversight if he doesn’t know exactly those for whom he is responsible? A distinguishable, mutually-understood membership is required for him to fulfill his charge. Down in verse 5 it says of an overseer, “for if a man does not know how to rule his own house, how will he take care of the church of God?” The local church is compared to a family. Is anyone a casual member of a family? No, membership in a family is a very definite thing. “Take heed to yourselves,” Paul instructed the elders of the church of Ephesus, “and to all the flock” (Acts 20:28). How could they fulfill their responsibility as undershepherds to “all” the flock unless they knew who was part of “the flock” and who was not? These leaders of a growing church in a large city needed some means of identification of those for whom they were to “take heed.” A simple membership list is the logical solution. In Hebrews 13:17 is a word addressed to those under such overseers: “Obey those who rule over you, and be submissive, for they watch out for your souls, as those who must give account. Let them do so with joy and not with grief, for that would be unprofitable for you.” For whom will the leaders of a church give an account-everyone who comes in and out of their church services? No, it has to be a limited group of people-the members of the church-for whom they will be answerable. Otherwise, how can church leaders be responsible for someone until they know he or she is committed to their care? The Bible’s instructions for pastoral oversight and spiritual leadership can best be obeyed when there is a well-defined church membership. The New Testament uses several metaphors to describe churches. Some of these metaphors describe the church of Christ collectively throughout the world. While all of them could potentially apply to the local church also, at least four of these metaphors- flock, temple, body, and household-are definitely used to refer to individual churches (in Acts 20:28; Ephesians 2:21; 1 Corinthians 12:27, and 1 Timothy 3:15). And each metaphor is best understood in a setting of specific church membership. A flock of sheep isn’t a random collection of ewes, rams, and lambs. Shepherds know their flocks. They know which sheep are theirs to care for and which are not. Sheep belong to specific flocks. This is also the way it should be for God’s spiritual sheep. A temple building, just like a church building, shouldn’t have any loose bricks or blocks. If it does, something’s wrong. Each one of them has a definite place. “There is no place,” said an English preacher long ago, “for any loose stone in God’s edifice.” (2) The same analogy is true for a human body. Your body isn’t a casual collection of loosely related parts. You don’t keep your fingers in your pocket until you need them. They are joined. They are members of the body. The local body of Christ should be like this also-those joined to Christ, who are members of His body-should express that relationship through a visible membership. And in a household, a family, you’re either a member or you’re not. So if you are part of the family of God, show it by joining a local expression of God’s family. Perhaps you are persuaded that the churches in the days of the New Testament had membership lists and that people joined the churches instead of “drifting.” Are there other Biblical reasons why Christians should be members of a church today? Here are some . . . When you join a church you make it clear whose side you’re on. You’re telling the family of God that you’re part of the family too, and that you don’t want to be considered on the “outside” (1 Corinthians 5:12-13) any longer. In Matthew 18:15-17, Jesus set up an accountability system. When a professing believer starts living like an unbeliever, those in the church who know about it are to confront him about his sin. First, one is to go to this person, and then, if he will not listen, the one is to bring one or two others along for a second conversation. The goal is to restore him back to full fellowship with the Lord and his fellow believers. If he persistently and unrepentantly refuses to return to the Lord, the final step is to report the matter to the church. Then everyone in the church has the chance to win the person back. And if he continues in his sin, the church is to withdraw fellowship from him as the final means of showing him his need to repent. If you aren’t part of the church, they have no authority over you and cannot do what Jesus said to do. Unless you join the church, your independence places you outside the way Jesus wants things to happen. Incidentally, when Jesus says in verse 17 to bring this matter “to the church,” how do you know who should be notified (and who should not be) unless there is a formally recognized membership? Related to this idea of spiritual authority, recall Hebrews 13:17, the passage we examined which tells us to obey the leaders of the church and submit to them because they keep watch over our souls. The leaders of the church are to “watch over” you by providing spiritual protection for you and caring about your growth in Christ. You place yourself outside that spiritual watchcare unless you join a local church. I’ve met a few people who weren’t interested in church membership but who were zealously witnessing to others about Christ and trying to make disciples for Him. Since they do so well what relatively few Christians do at all (i.e., share their faith), why emphasize church membership to them? They need to see that joining a church is like putting one candle with many others. They will give off more light collectively than the one lone candle ever could, and together they will have a greater penetration into the world’s darkness. And as your local church reaches across the country and around the world in direct and indirect support of missionary work, you can participate in ways of reaching the world for Christ that you could have never dreamed otherwise. In contrast, consider the potential negative impact on your efforts to talk about Jesus if you don’t join His earthly body. John MacArthur says we should ask ourselves, “How wonderful can Christ be if we’re not even committed to being associated with His church?” (6) How believable is our testimony of the goodness and greatness of Christ if we don’t want to identify openly with Christ’s family? At the moment of salvation when the Holy Spirit comes to live within a believer in Christ, He brings a gift with Him. “There are diversities of gifts, but the same Spirit,” Paul writes in 1 Corinthians 12:4. He continues in verse 11, “But one and the same Spirit works all these things, distributing to each one individually as He wills.” For what purpose does God gift each Christian? The answer is in verse 7: “But the manifestation of the Spirit is given to each one for the profit of all.” God gifts you individually so that you will use your gift “for the profit” of others. You have a greater opportunity to do that when you use your gift in and through local church membership. Yes, you can use your spiritual gift for the good of God’s people without joining a church. But in a lot of churches, many of the ministry opportunities are available for church members only. That’s because the church wants to know that you stand with her doctrinally and support her ministry goals before you’re asked to minister in certain positions. Besides, remaining outside the membership of the church may say more about your desire to serve than you intend. “Not joining the church,” according to MacArthur, ‘is saying, ‘I don’t want to serve the only institution Christ ever built.” (7) So the best way to maximize the effectiveness of your spiritual gift is to use it “for the profit of all” in a local church as a member. “Now you are the body of Christ,” Paul wrote to the church at Corinth, “and each one of you is a part of it” (1 Corinthians 12:27, NIV). But how can we see the body of Christ? When you join a church, you make it visible. You give a living demonstration of the spiritual reality of the body of Christ. You show that even though you are an individual, you are a part of the body, you are joined together with others. You take the body of Christ out of the realm of the theoretical and give it a meaning that people can see. In Ephesians 4:11-16 we read of the Lord giving gifted men such as evangelists and pastor-teachers to the church. We’re taught that each part-every member-of the church body has a job to do for the body to function properly and grow. It’s a picture of wholeness and balance. We need this God-ordained mutual ministry to be what God intends. Further, God has designed us so that we can’t get this well-rounded ministry on our own. No one develops the proper spiritual symmetry just by listening to Christian radio, watching Christian television, or reading Christian books. You can’t get this kind of maturity merely by participating in a group Bible study. Unless you’re an active part of a local church, your Christian life and ministry will be imbalanced. Some time ago in the magazine of the Moody Bible Institute in Chicago, a writer made an interesting observation about the hitchhiker. He wants a free ride. He assumes no responsibility for the money needed to buy the car, the gas to run it, or the cost of maintenance. He expects a comfortable ride and adequate safety. He assumes the driver has insurance covering him in case of an accident. He thinks little of asking the driver to take him to a certain place even though it may involve extra miles or inconvenience. Think about the “spiritual hitchhiker” who has settled all his major questions about the matters and has definitely decided where he wants to attend church, but now wants all the benefits and privileges of that church’s ministry without taking any responsibility for it. His attitude is all take and no give. He wants no accountability, just a free ride. This is not meant to discourage those who are attending a church to find answers about Jesus Christ and are still uncertain about their eternal destiny. If that describes you, your first priority is to come to Christ rather than to come for church membership. Neither is this intended to deter those who are sincerely and actively seeking God’s will in a decision about a church home. Sometimes that decision cannot be made quickly. A wise person evaluates a church carefully before joining its membership. In the familiar passage on church commitment, Hebrews 10:24-25 says, “And let us consider one another in order to stir up love and good works, not forsaking the assembling of ourselves together, as is the manner of some, but exhorting one another, and so much the more as you see the Day approaching.” Notice the command to “consider one another” that is associated here with church involvement. Bear in mind the message you give to other believers, especially new believers, if you do not join a church. What are you modeling to new believers when you remain uncommitted to the local church? Do they see your example and learn that the church isn’t important enough to join? Do they get the message that the Kingdom of God is not worth such an investment of yourself? Do they interpret your actions as saying that the work of God does not deserve a full commitment? If he says, “I’m just trying to make sure,” how do you think she would feel? Of course, she’s glad he says he loves her, and she’s thankful for all he does for her, and she’s pleased that he doesn’t see anyone else, but in spite of all that, she’s going to be somewhat discouraged because he doesn’t love her enough to decisively commit himself to her. The people and pastor of a church are glad whenever you attend. But if you keep coming and never join, they may begin to wonder what Mary wondered about John, despite how happy you seem to be with the church and how many wonderful things you say about it. So there is a sense in which your attendance and involvement can actually discourage the church and its leaders if, after a reasonable time, you do not join it. Conversely, the church is encouraged (the NASB and NIV render “exhort” in Hebrews 10:25 as “encourage”), and its leadership is encouraged, when you indicate by joining the church that you love it and think it is a Biblically faithful ministry worthy of your commitment. Now that you’ve read these things about church membership, what should you do? What should you do? The Bible says you should repent and believe in the Gospel (Mark 1:15), i.e., the message about the life, death, and resurrection of Jesus Christ. To repent and believe in this way involves turning from living for yourself and turning in faith to Jesus Christ. Recognize that your sin has separated you from God (Isaiah 59:2; Romans 3:23). You’ve repeatedly broken God’s laws and this excludes you from His family and from eternity with Him. Come to Christ, however, and He can make you right with God. Believe that His death can cleanse you from all guilt before God and provide you with all the righteousness God requires. This is infinitely more important than church membership. Ten days after Jesus had ascended back to Heaven, the Holy Spirit of God descended upon the believers who were gathered in Jerusalem. Filled with the Holy Spirit, Peter preached that morning to the crowd that had gathered because of the Jewish Feast of Pentecost. About three thousand people turned from their sin and believed that the crucified and risen Jesus was their Messiah and God. Then, according to Acts 2:41, “those who had gladly received his word were baptized.” If you have received (i.e., believed) the word about Jesus Christ, you should be baptized. Baptism is a church ordinance commanded by Christ (Matthew 28:19). If you have trusted Jesus Christ as Savior and Lord, you should present yourself to a local church as a candidate for baptism. By this means you will openly identify yourself as a follower of Christ and a member of His body. When I was in college I faithfully attended a local church. After about a year I realized that my membership needed to be in that church, not the one back home that I grew up in but now rarely visited. So I presented myself for membership in the church where I was worshiping regularly. Today I encourage students to become members of a church in their college town, because that’s where they are most of the time. If they are home for the summer, I suggest that, if practical, they move their membership back to their hometown church for those three months. There are two good reasons for doing this. One, there’s no guarantee that their plans won’t change and that they won’t be back either at their school or at that particular church in the fall. Two, this develops a healthy pattern of thinking “Join a church here” whenever they relocate. This habit will serve them well when they graduate and move away from college to who-knows-where, not to mention each of the several times they are likely to move in the coming decades. If you are presently a member of the local church you attend, you should exercise your spiritual gifts in and through that church (see Romans 12:5-6a). Membership implies commitment and activity. All the living parts of the body of Christ should be working and fulfilling their God-intended function. Think about this: a member of a human body, such as a heart or kidney, cannot exist apart from the body, except by some temporary and artificial sustenance. But this isn’t what it’s designed for. In this sheer existence the organ doesn’t fulfill its function in the body. It isn’t nourished in the way God intended through the body, but subsists only through some synthetic way that provides mere maintenance but doesn’t stimulate growth or development. In the same way, a true member of Christ’s body is not designed to operate independently or outside the body. An authentic part of Christ’s spiritual body cannot be content while separated from the rest of His earthly body. That’s because he or she is made for interdependence, not independence. As wonderful and sophisticated as the heart is, it was never made to be just a heart, but a part of a body. It has no value to the body outside the body. And the heart itself can’t thrive outside the body. As incredible and wonderful as you are, Christian, you were never made just to be an individual Christian, but a part of body. As every organ and every cell is God-created to be an active member of the human body, so every true Christian is God-created to be a active member of a localbody of Christ. (1) C. K. Barrett, A Commentary on the First Epistle to the Corinthians (New York: Harper & Row, 1968), p. 324. (2) Joseph Hall, as quoted in John Blanchard, More Gathered Gold (Welwyn, England: Evangelical Press, 1986), p. 43. (3) G. Eric Lane, I Want to Be A Church Member (Bryntirion, Wales: Evangelical Press of Wales, 1992), p. 21. (4) Douglas G. Millar, “Should I Join A Church?”, The Banner of Truth, Issue 62, Nov. 1968, p. 21. (5) John F. MacArthur, Jr., “Commitment to the Church,” Tape GC 80-130 (Panorama City, CA: Grace to You, 1994. (6) MacArthur tape GC 80-130. (7) MacArthur tape GC 80-130. (8) Ben Patterson, “Why Join A Church?”, Leadership, Fall Quarter, 1984, p. 80. (9) MacArthur tape GC 80-130. (10) D. Martyn Lloyd-Jones, Knowing the Times (Edinburgh: The Banner of Truth Trust, 1989), p. 30. 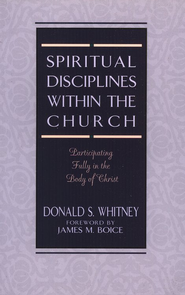 *Adapted from Spiritual Disciplines Within The Church by Donald S. Whitney, Moody Press, copyright 1996. Used with permission. Tags: BIBLICAL REASONS FOR JOINING A CHURCH, Can you be a Christian and not go to church?, Church membership, Donald S. Whitney, Why church membership?, Why Join a Church?